Two well established SC artists team up to present an eclectic show and sale of their most recent work at Vista Studios/Gallery 80808. 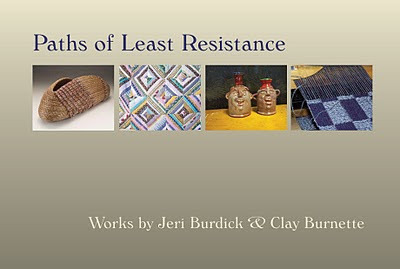 Paths of Least Resistance – Works by Jeri Burdick and Clay Burnette opens with a reception on January 7 from 6 – 9 PM. Those who have followed the creative paths of Jeri Burdick and Clay Burnette for the past 35 years expect to see Burdick’s ceramic pieces and Burnette’s pine needle baskets. However, through the years, both artists have taken other paths of least resistance that some may not be aware of. In addition to her ceramic plates and bowls, Burdick will be showing hand-pieced quilts, paintings, lamps, tables and mixed media wall pieces. Along with baskets coiled from longleaf pine needles, Burnette will present handwoven scarves and beaded necklaces. To the artists, Paths of Least Resistance refers to the flow of energy that drives them to create on a daily basis. It is the creative act that is performed with no struggle – relying solely on the natural flow of ideas, with no pressure accepted or expended. The paths lead them to their studios, where the desire to create is pacified for the moment while other time consuming demands of the day are set aside. A path of least resistance is described as effortlessly riding a horse in the direction it is already going. Both artists have developed a strong common bond through their many years of friendship. They both were born in 1951 and have both received the SC Arts Commission Fellowship in Crafts – Burdick in 1986 and Burnette in 1988. Their works are included in the permanent collections of the SC State Museum, the Columbia Museum of Art, and the SC State Art Collection, as well as many private and corporate collections. They are founding members of Cats on a Leash, a 7-member contemporary arts group formed in Columbia in 1985. Both artists have been exhibiting members of the SC Crafts Association, Piedmont Craftsmen, the American Crafts Council, and the prestigious Philadelphia Craft Show. And both artists were included in 100 Years/100 Artists: Views of the 20th Century in SC Art, a major exhibition at the SC State Museum in 2000. Jeri Burdick is a professional visual artist from Eutawville who has established a strong base of support in all regions of the state and has had gallery representation throughout the US and Canada over the course of her career. After obtaining a BFA from the University of Georgia and a MA from Furman University, she taught in the Greenville Co Public Schools until becoming a full-time artist in 1982. Along with her partner, Kitty Parrott, she established Radcliffe Street, Inc., which continues to offer services in residential, commercial and education applications as well as finished original art in a variety of media. In 1988 she had her first series of drawings for “The Fisherman’s Tale” selected for international publication by Green Tiger Press, with a subsequent book “The Sailor Cats” published by Simon & Shuster in 1993. She has participated in numerous group and juried exhibitions, created mural installations through the SC Artist in Residence school program and designed/installed residential and commercial mosaic compositions; all while continuing to provide unique pieces for individual and corporate clients. Clay Burnette has exhibited his work throughout the US and Great Britain. He received AS, BAIS and MLIS degrees from the University of SC and is employed as Director of Grants and Fellowships at the SC Arts Commission. His pine needle baskets have been exhibited in over 200 events, including the Smithsonian Craft Show, SOFA (Sculpture, Objects and Functional Art) New York, SOFA Chicago, ACC Atlanta and ACC Charlotte Craft Shows. In 2000, his work was selected for inclusion in Contemporary International Basketry, an exhibit that toured the United Kingdom for two years. His works have been included in numerous printed publications including Contemporary International Basketmaking; Baskets: Tradition and Beyond; 500 Baskets; Baskets: A Book for Makers and Collectors; Beautiful Things; and Craft in America. His work is currently touring nationally in Tradition/Innovation: American Masterpieces of Southern Craft & Traditional Art, presented by SouthArts, Atlanta, GA. The opening reception for Paths of Least Resistance will be held at Vista Studios/Gallery 80808, 808 Lady Street, Columbia on Friday, January 7, from 6-9 PM. The gallery will also be open on Saturday, January 8, from 11 – 3 and Sunday, January 9, from 11 – 2. For additional information, contact Clay Burnette at [email protected] or call 803-553-6173. ← Vista Studios in Times Square!